Sunbrella Custom Shade Sails provide maximum protection from the sun and its harmful UV rays. They are available in a variety of sizes, colors, and shapes, including squares, rectangles, equilateral triangles, and right angle triangles. Each sail comes with user friendly instructions for installation. With shade sails, you can cover your patio, swimming pool areas, gardens, children's outdoor play areas, parking areas, and any area around your home where you would like shade and protection. Shade sails are also ideal for use around office buildings, in courtyards, and in outdoor eating areas and break areas. Sunbrella® shade sails can be mounted to practically any surface and are simple to install. Sunbrella® Custom Shade Sails are made with durable and breathable Sunbrella® fabric that helps to keep you cool and comfortable even in the hottest weather. These sails are covered with a limited 10 year warranty and provide you with a UV protection factor of up to 98%. Sunbrella's state-of-the-art solution-dyed acrylic fabric is fade and water resistant. The fabric also resists stains, mildew, and rot. The perimeter of each sail is surrounded with a seat belt type webbing for increased strength and durability. Each corner has a welded solid marine grade stainless steel attachment ring to aid in attaching the sail to a structurally sound fixing point. Sunbrella® fabric is water resistant, and shade sails made from this fabric have to be installed with at least a 20 degree slope to allow water to run off and not pool on top of the sail. The chart above lists measurements for the amount of vertical drop recommended based on the size of the sail. Measurements are rounded. Due to the limited fabric widths available for Sunbrella® fabric, your shade sail will have seams approximately every 40-57 inches. To obtain a quote or to order a custom shade sail, complete the Custom Shade Sail Quote Form and fax it to 901-531-8436. It will take approximately 2 business days to process and quote the shade sail you need. 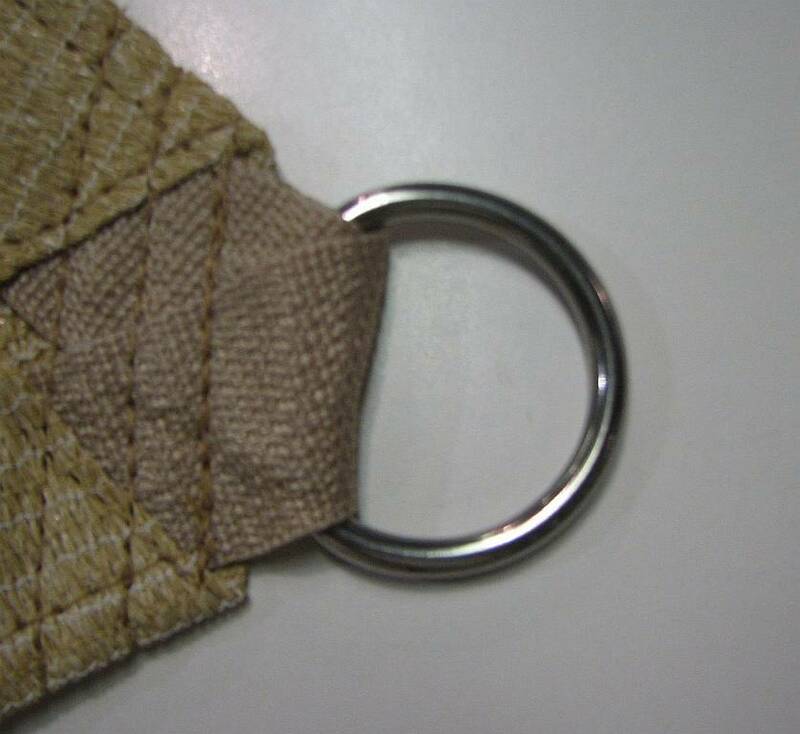 Residential sail with 1-1/2 inch UV inhibitive reinforcement webbing. Appropriate for normal residential use in sails up to about 325 square feet. 1-1/2 inch webbing is rated at an 800 pound break strength. Starting at $4.39 per square foot. Heavy residential/light commercial sail with 2 inch UV inhibitive reinforcement webbing. Appropriate for smaller commercial applications and for larger residential use in sails from 325 to 500 square feet. 2 inch webbing is rated at a 5,500 pound break strength. Starting at $4.92 per square foot. Light commercial sail with 1/8 inch steel cable reinforcement. Appropriate for smaller commercial applications where a steel cable is required or for residential use. For use in sails up to 325 square feet. 1/8 inch cable has a 400 pound work load strength and a 2,000 pound break strength. Starting at $5.43 per square foot. Commercial sail with 1/4 inch steel cable reinforcement. Appropriate for larger commercial applications where a steel cable is required or for larger residential sails. For use in sails 325 square feet or larger. 1/4 inch cable has a 1,400 pound work load and a 6,000 pound break strength. Starting at $6.00 per square foot. Please Note: Some shade sail shapes and sails with additional corners will have additional costs. Right angle triangle shade sails with short edges less than 1/2 the length of the longest edge are not recommended because you end up with a very thin shade sail. There is a 50 square foot minimum charge for custom shade sails. All custom shade sails are made to your specifications. Therefore, all sales are final. No refunds or returns will be accepted.